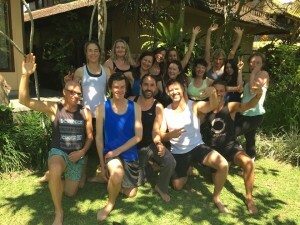 Dates : The yoga intensive will run from 7:30am on Sunday May 26th, and conclude at 6pm on Saturday June 1st, 2019. There will be two yoga sessions each day at 7.30am-11am and 3.30pm-6pm. The morning sessions will focus on energising the body through Standing poses, Balancing asanas and Backbends. The afternoon sessions aim to relax the body and quieten the mind through inversions and Pranayama. individually by participants. Arrival is recommended a few days (1 day at least) in advance of classes, to help students acclimatise. There are many accommodation options available near the Santra Putra studio. Accommodation located in Champuan or Penestanan, west of Ubud, will be close to the studio. The Lonely Planet or Rough Guide for Bali can be useful guides, when searching for accommodation. The owner of Santra Putra studio, Wayan Karja, has several houses for rent in the area. Other accommodation located nearby includes Melati Cottages, Penestanan Bungalows and Ananda cottages. To find out about our regular workshops, please visit our Yoga Intensives page.